Patch is a unique stool manufactured out of the leftover fabrics from our own production line. What makes this stool unique is its manufacture. The seat comprises three parts which are individually covered with leftover fabrics from our own production process. Patch. Recycling for the design conscious. When ordering Patch you can choose which of the colour scales it will be made from. And that’s about it. The three seat components are made from waste fabrics from our production line, and the finish given to your stool is defined by which textiles are available at the time. Patch is a stackable stool which is perfect to have close at hand for those spontaneous meetings. But what really makes it stand out is that it has been designed with recycling as the core theme. Its design is based on waste fabric which makes it an interesting feature in an interior. Not least when you set up a number of Patch in a group and the seat’s colour variations augment the unique expression of each stool. We sort all our leftover fabrics into seven colour scales, which are then used in the production of Patch. 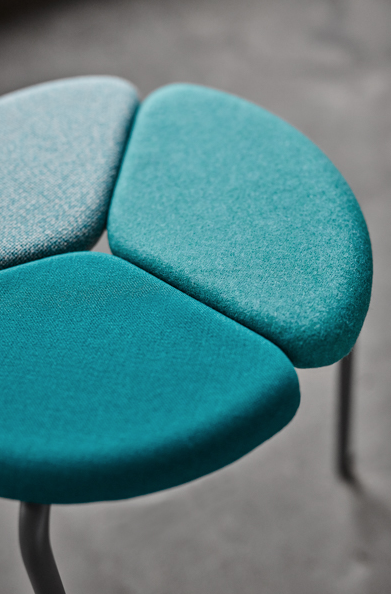 Each stool has its own combination of textures and shades within the colour scale. Each part has its own fabric, but they are all within one of seven specific colour scales. In other words, what your Patch is going to look like is governed by what leftover fabrics we have at the time. So you can never know precisely which textures or shades your Patch will have, only that it will be within the colour scale you have selected. In return, you obtain a highly unique piece of furniture, manufactured with consideration for our Environment.